I bought this to wear while out on delivery as Royal Mail postman and it does the job perfectly - it's light when your wearing it or carrying in a bag ; the brim is stiff enough to keep it's shape without going floppy and the vents keep you reasonably cool (I haven't tried submerging the crystals yet but I'm confident they'll cope with the Scottish Summer!) Only moan I've got is that a week after I bought this I discovered it was available in a darker grey which would have matched Royal Mail uniform perfectly. This is a decent hat of sufficient quality. There are nicer hats on the market, but then you will pay a lot more. And there are certainly many cheaper ones of inferior quality. I have used this hat for a couple of trips to Asia and it works just fine. It has a wider brim than most outback hats, which is very good when the sun is at it's peak. Snap-up sides is also a good feature which many ordinary boonie-hats do not have. I'm sure this hat will last just as long as a premium hat. The difference is more about style. Only complaint I have is that it is a little on the heavy side. Also I got rid of the ridiculous "cooling crystals" in the sweat band. Just a silly marketing trick without any real practical function. 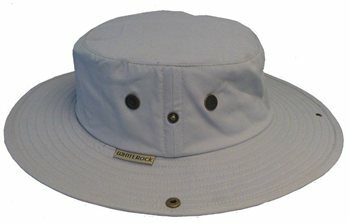 I would recommend this hat for rugged and reliable sun protection without fancy design. Personally I think it's better to look a little rugged when traveling so this hat is perfect for me.